Make into a delicious mousse, shake it, or bake into simple recipes. Smart Protein is the brand new, deliciously versatile High-Protein, low-sugar powder from PhD Nutrition that can be made into a fantastically-indulgent mousse, baked into your favourite, simple recipes, or used as a protein shake between meals. High Protein, Low-Sugar Mousse. Unlike traditional protein powders, Smart Protein can be transformed into a great-tasting, dessert-style high protein, low sugar mousse within just 30 seconds- no need to leave overnight in the fridge to set, just stir up and enjoy immediately. This High-Protein, low sugar mousse, can be eaten at any time your sweet tooth is craving indulgence, or mid-morning/mid-afternoon when a macro-friendly snack is exactly what you are looking for. It’s so simple and takes only 30 seconds, a spoon, a serving of Smart Protein and a bowl or cup to make. Mix 1 scoop with 150-200ml of cold water. Whey Protein Concentrate (Milk), Milk Protein Concentrate, Whole Grain Oat Flour (Gluten), Fat Reduced Cocoa Powder, Cacao, Flavourings, Sodium Chloride, Potassium Chloride, Stabilisers (Acacia Gum, Xanthan Gum, Guar Gum), Sweetener (Sucralose). 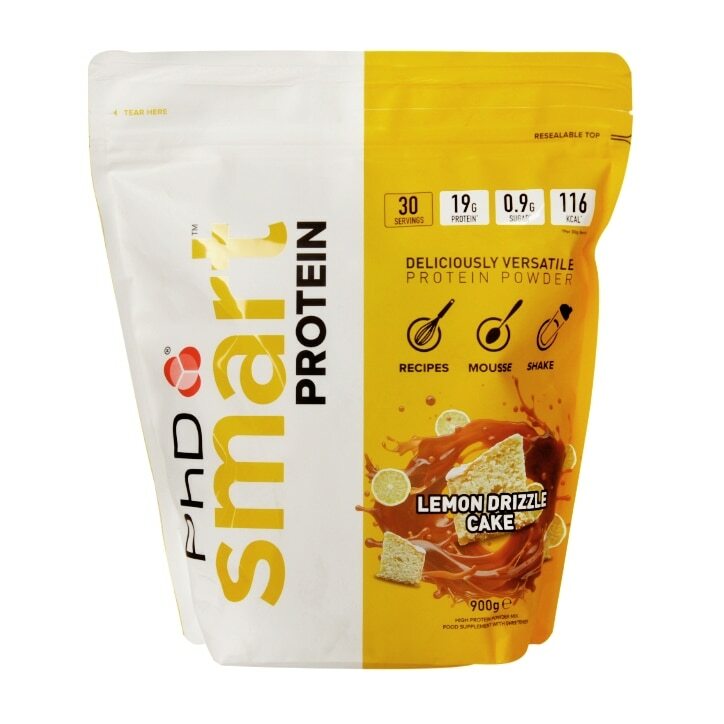 PhD Smart Protein Lemon Drizzle Cake is rated 4.8 out of 5 by 9. Rated 5 out of 5 by Antoz from Excellent product I'm very happy for this product the flavour is incredibly really you need buy.. Rated 5 out of 5 by Daydo from Gorgeous tasting, I mix it with porridge. I also mix it with Mascarpone cheese for a great tasting desert. Rated 4 out of 5 by Tuuu from Very special flavour This something different. I tried the mousse, not my cup of tee, too strong flavour for me, then used as normal shake, had to overthin it to overcome the strong flavour and it became unusually lumpy. i currently add half a teaspoon of this to my other shakes to add some lemon zest into their standard flavour. I am sure this is a great idea, just not for me. I dont like sweets or cookies either, so i did not try to bake with it. If you love lemon peel you’ll love it. I was more into the sour taste of lemon juice, but this is not about that. I’ll stick to my regular phd shakes.